This lecture highlights new work by from Lord Tredegar’s biographer William Cross. 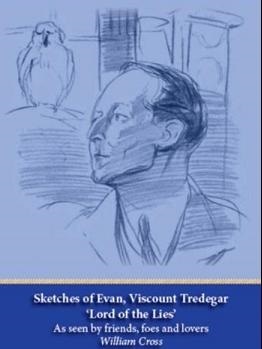 In the talk Cross sets the mould for understanding Evan Frederic Morgan (1893-1949), eccentric Welsh aristocrat, notorious homosexual, congenital liar & fantasist, the last Viscount Tredegar, of Tredegar House, Newport, South Wales. Here is the actuality about Evan recalled by those who knew him, friends, foes & lovers. In this selection the contributors are Evan’s crowd, some habitués at Tredegar House during Evan’s tenure. Story tellers include Cyril Hartmann, Robin Bryans, Charles Graves, Desmond & Shane Leslie, Alan Pryce-Jones & Henry Maxwell. This is promotional talk highlights Evan Morgan's life with frank descriptions, candid opinion, rare personal reflections & colourful anecdotes to shed light on his twisted personality. William Cross adds "There are still many tall stories about Evan Morgan, and so called facts have been invented, in some cases these are not better than lies.."